Please allow time for photos to load, 7 FABULOUS Photos! Charge it! Former head designer for Bill Blass! Numbered Certificate of Authenticity hangtag also included. 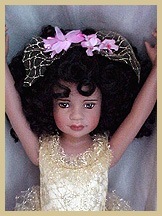 About 14 inches tall, she wears a beautiful gold tutu with bronze flecked stockings and gold ankle tie shoes. 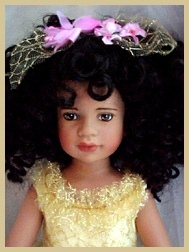 Her thick, dark curly hair is adorned with a pink crescent of flowers and golden net. She is totally SOLD OUT and RETIRED at the Tonner Company and very hard to find in this mint condition with such thick hair! New from gallery stock. She comes in her original white box with red hearts (some light red smudges on box from other boxes stored on top at the company). USA Buyer pays ship/insure UPS from Boston, MA 02116, approximately 6 pounds ship weight. International please e-mail. Tonner's work can also be found in the Museum of Decorative Arts at the Louvre in Paris! His works also have been featured on: CNN, Entertainment Tonight and in British Vogue and People Magazine.